I recently met Dan during a lunch stop on a 200K permanent that Felkerino and I were doing. Dan was riding a populaire with some friends out of Frederick, Maryland, and his group had stopped for lunch at the same establishment. Everyone had placed their bikes wherever space allowed alongside the restaurant. 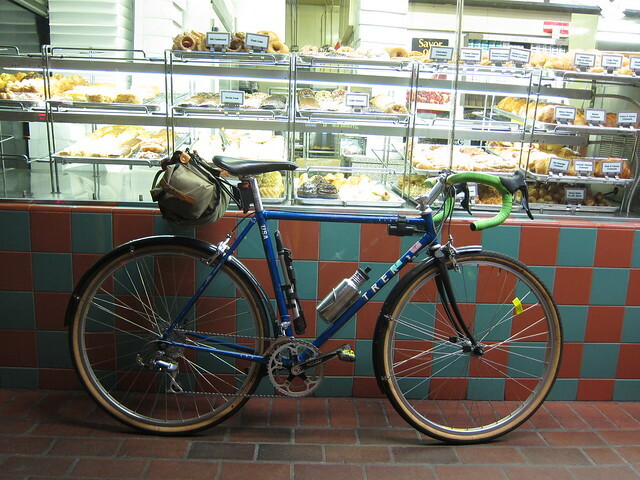 Amid the menagerie of bikes, Dan’s Trek caught my eye. Subtle and elegant, with a thoughtful build. I asked Dan to be a Bikes to Like guest contributor and, as you can see from what follows, he was up for it. Thank you, Dan, for sharing the story of your bike! I have a 1987 Trek 330 frame with a whole bunch of non-original parts. In fact, NO original parts. It’s one of the ‘Elance’ series, which I believe were some of the first Taiwanese manufactured Treks. Originally, it was a decent, middle of the road, steel sport bike, and the most basic in Trek’s stable for the year with things like SR cranks and basic Suntour components. It’s made of Reynolds 531, as all of the Trek sport frames were that year. Actually, all of the sport frames of that year- top to bottom of the line- also had the exact same geometry and materials as well. The only differences seem to be the parts they put on them and the paint colors and the decals. 2. How did you come to own this bike? I occasionally work with the fine folks at The Bike Doctor in Frederick, Maryland, and came to know the local Trek representative, who is a collector of old Trek frames and bikes in his service area. If any old ones come available, he usually picks them up for not a whole lot of money, or sometimes free. This one came to him on one of his missions abroad, and he’d converted it into a fixie long before I knew him. 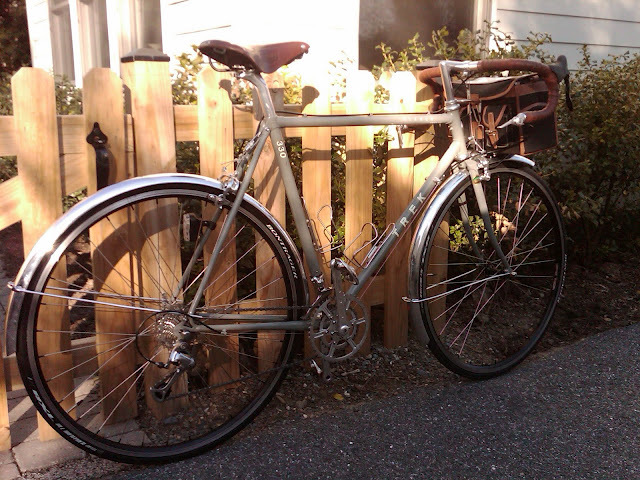 I had a modern steel Masi I’d been riding that really didn’t fit the bill for me super well, and when I saw it in his basement, it being a 55.5cm (close enough to my size), I asked him if he’d ever consider selling it. I’d set up a couple of guitars, recorded some music, and done a favor here and there for him and friends so he decided to give it to me (!). It’s my musical good-karma bike. 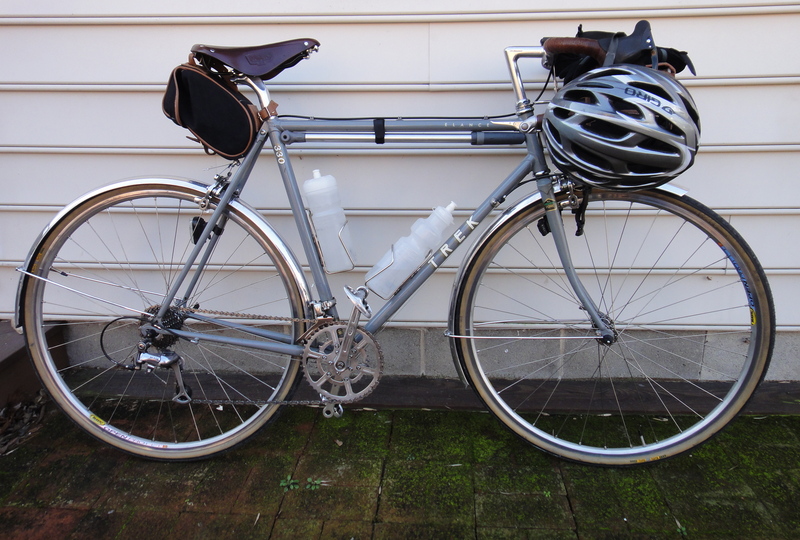 I’d been dreaming of a custom Mercian or a Weigle or Waterford (or a Singer or Herse)- pure unobtainium. But when I looked up the specs of this Trek frame, it wasn’t so far off from what I was looking for, especially for the price! So I dove in. 3. Where do you ride it? I ride this bike wherever I can, within reason! 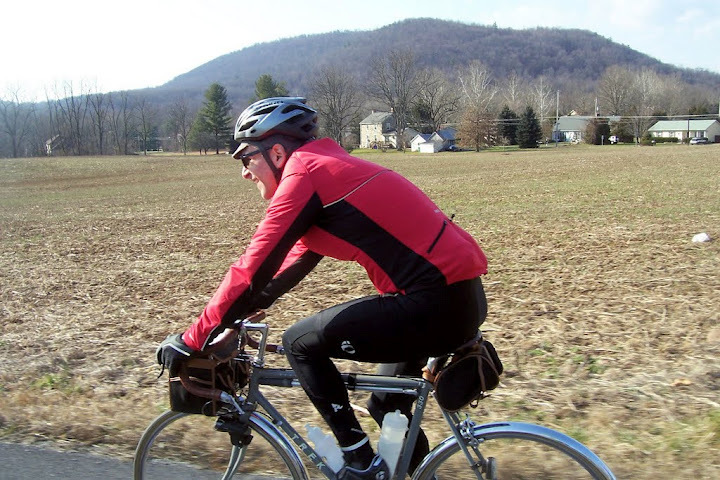 It’s certainly seen it’s share of non-paved roads, as the folks I typically ride with up here in Frederick tend to ride stretches of substandard-to-modernity road at least as often as they ride on blacktop. It’s more my sport rider than anything else. I have a couple of others for townie purposes and commuting but the Trek has done duty for those as well. 4. What do you like about your bike? I’m pretty fond of the familiar ride of the Trek. It reminds me a LOT of a used and ragged old 531 Alpine road bike that I scavenged back in the mid 80’s, which I really really loved, as it was my first ‘real’ road bike. I like the fast, but stable handling. I love that the frame climbs well and has a comfortable amount of flex, both up and down AND side to side. I love that it had all the necessary bosses for fenders. I love the color. I like that it’s paid for without having needed to win the Lotto. I’m also very partial to the fact that my friend/neighbor James and I had prolonged discussions/arguments/beer drinking sessions/one-sided ride “discussions”/ book and catalog swaps/ internet link-o-metry/ email battles/repair stand circumspections about it for over a year. In a way, it’s a monument to research, discourse, cussing, patience for overdiscussion, and male bonding idiocy, as well as a bicycle. 5. If you had to describe your bike in one word, what would it be? 6. Fenders or no fenders? 7. What is one of your favorite memories with this bicycle? The first half-mile ride around my block after getting all my parts put on it. I didn’t even have brakes on it yet! I just remember going from a stiff modern steel bike to this and feeling like I was riding something that was very much more alive and spring-ish and, for lack of better words, proper. I remember feeling like I’d come home again in a lot of ways and having a full-on Frankenstein “IT’S ALIVE” moment. 8. Does your bike have a name? If so, what is it? Sadly, I’ve never given it a proper name. I do refer to it as “Bea” more often than not. A Mazda truck and an old cat of mine, both of which are the same color as the bike, are also called by the same name. 9. What is your favorite accessory on your bike and why? I’m pretty fond of the Brooks handlebar tape, which was recycled from a Bianchi whose owner had shellacked it, hated the look, and was throwing it away (!). I soaked it in denatured alcohol for a couple of days, which at first looked as if it had TOTALLY ruined it. I then oiled it repeatedly with proofide until it resembled something not made of beef jerky again. Somehow it has survived two years of use with me, and seems like it’s got quite a few more to go. 10. What did I forget to ask that you want to tell me about your bike? A whole bunch. Thanks Velo Orange! A number that might make me seem as if I have OCD were it to be disclosed. I think, in general, though, this bike has been a project of finding lots of practical solutions to the “problems” of riding and it’s gone through a few iterations. The parts selection was one of figuring out what I needed versus what I could afford and also, what was available, pretty much like everyone else doing a custom build. 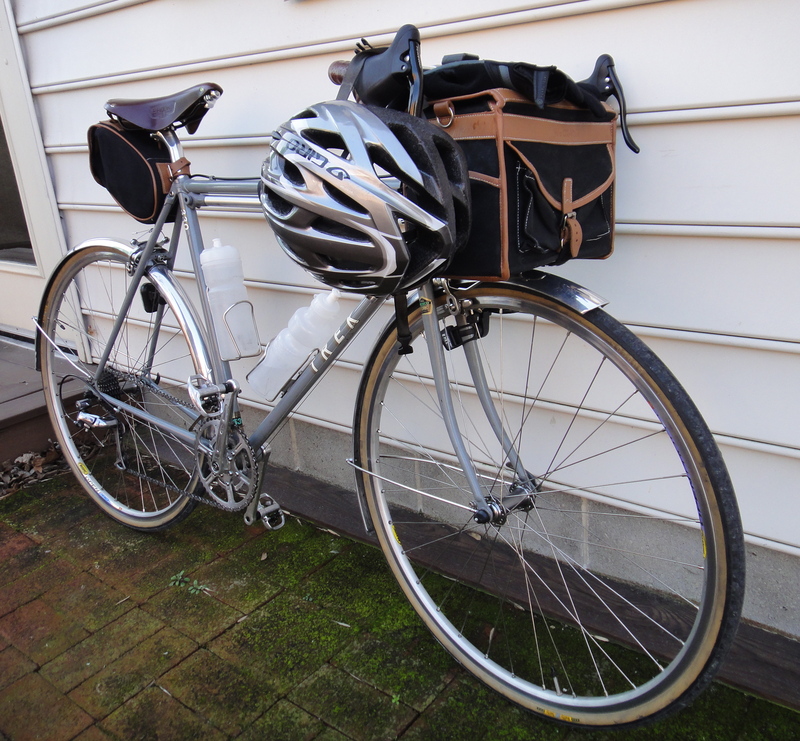 My particular needs were keeping a narrow stance (which I prefer over wide-set modern cranks), wide gearing without a triple crankset, a lively ride with durable parts, and having a front bag. Oh, and as little black anodized stuff as I could get away with, mostly because I grew up with silver metals on bikes and prefer it. Beyond that, I just wanted it to be a classy ride with a classic randonneuse sorta look to it. 11. If your bike could talk, what is one thing it would say to you? It might ask me why I don’t convert it to a 650B so I stop denting my front fenders with my feet. Thank you, what a great write-up on the Trek 330 Elance. I also own a 1987 330 Elance, I was in highschool and worked all summer at Taco Bell to buy it. It currently needs some work, and has been relegated to the corner of the bike storage area of my condo complex, but this has inspired me to get it rideable again. Thanks, great piece that has made me want to ride my Elance again. Do it B & P! Loverly riding bikes, these, and totally worth the effort. Thanks for asking me to do this, Mary– fun to recount how the B came into existence and why! Pingback: The Grand Fondue: A Superbly Challenging Bike Ride | chasing mailboxes d.c.